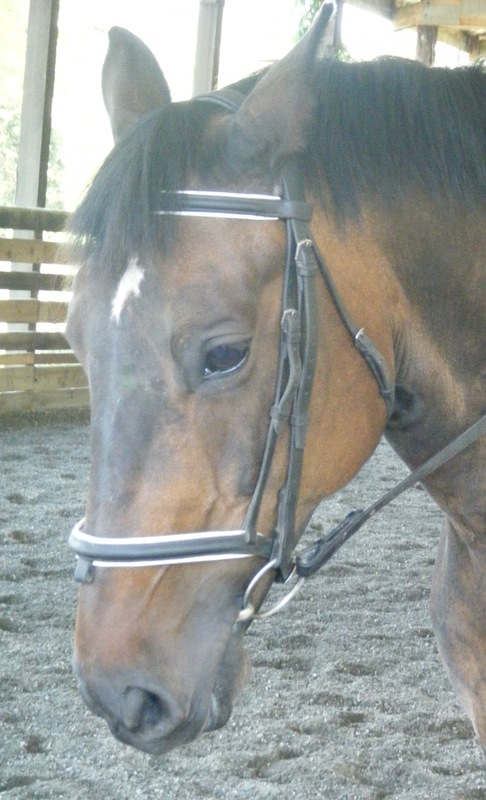 I've had "Fable," a dark bay Holsteiner gelding, in training for a number years. I adore him. He's a handsome fellow with more than a couple of interesting quirks. Let me be very clear that the very first time I met him he oozed attitude. It was a while ago, so I'd be lying if I said I saw something more noble under that sullen and disrespectful demeanor. However, I know myself well enough to say that I must have. I like a challenge, but I'm no fool. I want at least a flicker of hope that I'll succeed before I start a project. Otherwise, why bother? And frankly, with a horse, why put yourself at such physical risk? Since that first meeting, Fable has taught me well. He has taught me that cooperation requires respect from both parties. His "you can't make me" attitude has shown me that "yes, I can" must not only be accompanied by firmness, but also a willingness to change an approach when no progress is noted, coupled with a dogged determination to focus on the clarity of the goal. He has taught me not to let a moment of disagreement dissolve into a fight where the focus becomes the fight. No one wins in that situation. So, what has been the outcome? Has he abandoned his attitude, donned the mantle of submission? Transformed into a shining example of cooperation? He's lost the sullenness, but he's retained his opinionated personality. Sure, his first reaction is still to argue when he doesn't understand a request, but the arguments are brief (far less explosive) and simply a way of communicating that he is unclear. He knows I'm listening to him -- no need to wage a war. And here's the really cool thing: Once he understands, he not only does what he's asked, but improves with each repetition. I call that, "generosity." I'd never have known he possessed that quality of spirit when we first met. Thanks, Margaret! Fable's a really cool guy and a demanding teacher. I've had to pay attention! Horses do have a considerable amount of wisdom to share -- they make you work for it, though! Learning to listen is difficult, no doubt about it. Thanks so much for stopping by! Love your story about Fable. I find horses that "ask questions" about the rider's directions much more intriguing than the compliant ones. Keep on doing what you're doing! You and your fabulous horses are such incredible teachers. Well, mostly you, clearly. Hi came over from the carnival - Fable sounds like quite a character and yes a generous one as well. Thanks for stopping over! Love the carnival. Lots of good reads :) Glad you enjoyed Fable! I was curious... how often do you ride him a week. I just read that three or four days in a row is better than every other day for training and "attitude". Of course, one's schedule may not allow it... but I was just curious what you did with this guy. I only ride Fable twice a week. His owner rides him also, but he's rarely worked more than 4 days a week. Although horses have amazing memories, consistency in the way the horse is handled and ridden is key to effecting any progress or lasting change. Fable is particularly sensitive to any inconsistencies -- which has it's own challenges for the human :) -- some horses will guess when they don't understand what is being asked, but he won't. He has always simply gotten upset when he doesn't understand. Attitude can be difficult to deal with, and with horses being so big and powerful it's not something you want to deal with without professional or experienced help. Fable sounds a lot like my mare Em, except Em hasn't been in training that long and I have the occasional "fight" with her. I have learned that insisting on "my way" or trying to force my way doesn't work and am searching for the point of agreement, where we can understand each other. It happens every now and then, but there is still a lot of struggle. Right now she refuses to go in the trailer after having been injured in it. I have used assertiveness, which only produces resistance, and I have used food bribes, which haven't worked, and we've been patiently hanging around the trailer and trying repeatedly to walk in without force. No luck so far. Any suggestions? Thanks. Anonymous -- A horse having been injured -- or even frightened -- in a trailer can be a hard situation to overcome. It can be done, however. I've read Monty Roberts' book From My Hands to Yours and also seen him work. He's had a lot of success with his methods, which involves a working on the ground using clear communication and calmness with the horse -- before approaching the trailer. You might start there. I find that most horses who refuse to do what the rider or handler asks simply don't understand what is being asked -- or misinterpret. One student I had a while ago was frustrated because she thought her horse was being disobedient on the lunge line by stopping or reversing direction on his own whim. I watched her and within a couple of minutes could see clearly she was actually telling her horse with her body language to stop and reverse (pulled her hand holding the line in to her chest and stepped in front of that imaginary line that goes from the handler to the horse's girth area). Her horse was actually doing what he was asked, and very nicely! Your best bet is to work with an experienced trainer. Ask around, if you don't know anyone, go watch them work with the horses they have in training and talk to them about their training methods. The more knowledge you gather the more successful you will be. Thank you! I will look for a trainer.